A small Indian barge port Dharamtar located about 24 km from Jawaharlal Nehru Port Trust (JNPT) will be brought back to life when Singapore’s PSA International opens its Bharat Mumbai Container Terminals (BMCT) in December 2017, informs The Hindu BusinessLine. This week, BMCT has signed a Memorandum of Understanding (MOU) with PNP Maritime Services Pvt Ltd (PNP), a multi modal transport and logistics operator running a lighterage port at Dharamtar, to handle a regular container barge service between Dharamtar Port and BMCT from the end of 2017. PNP operates the Dharamtar port, which handles annually about 5 mln tonnes, since 2001 on a 30-year concession from the Maharashtra Maritime Board. The barge service to Dharamtar was the basic logistic route for cargo owners in the area until the lack of dedicated berthing facilities for the barge at JNPT forced its closure in 2012. According to PSA, with the opening of BMCT Phase 1, PNP will restart a daily barge service between BMCT and their facility in Dharamtar with an 80-TEU barge, offering cargo owners cost and time savings, as well as a more environmentally friendly and reliable transportation option. The barge service will also give a boost to the government’s plan to promote coastal shipping and inland waterways. 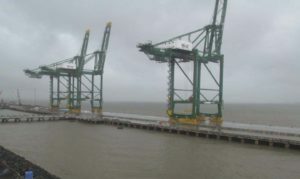 BMCT will become the fifth container terminal at JNPT, the biggest container port in India, handling annually around 4.5 mln TEU, or 55% of the country’s containerized cargo. The largest part of the port’s container throughput is handled by APMT’s Gateway Terminals India (39.8%), followed by the port-owned JNPCT (34%). DP World’s Nhava Sheva International Container Terminal and Nhava Sheva Gateway Terminal have less shares of the pie: 16.2% and 10% accordingly. PSA commenced the construction of BMCT two years ago, in October 2015. The terminal is constructed in two phases. With Phase 1 to be completed in December 2017 its annual capacity will be 2.4 mln TEU. The estimated cost of the project is USD 1.22 bln. At full development, BMCT will have a quay length of 2,000m, 24 quay cranes and a designed capacity of 4.8 mln TEU per year.